From the beginning, Leopold has been synonymous with rapid gravity media filtration. Over the past 80 years, we've proven our expertise and leadership in filtration technology and offer a wide range of systems and equipment that employ the many innovations we have pioneered. Located in Watsontown, Pennsylvania, the Leopold facility carries more than 5,000 tons of premium NSF 61 approved anthracite in more than 25 different ES and UC combinations - ready for quick delivery worldwide. All anthracite purchases can be independently sampled and tested prior to shipment. Tamper proof seals can also be installed by the purchaser on all anthracite immediately after sampling. The Leopold Trough-Guard media baffle is a stainless steel assembly that is fastened onto both sides of wash-water troughs to help prevent significant media loss during concurrent air/water filter backwash. In the battle with hard-to-treat contaminants, drinking water just got a powerful new ally. Leopold Oxelia™ oxidation-enhanced biologically active filtration system. Biological and chemical contamination in drinking water poses a significant public health risk and plant operators require a treatment system that allows them to produce a safe and reliable supply of clear, good-tasting and biologically-stable finished water with the lowest concentrations of non-desired substances. The Ultrascreen disk filter is compact and modular, with “plug n play” ease, reducing construction footprint and providing quick and easy startup. Its high hydraulic loading capacity and in-service backwash feature (no need to provide additional units to handle flow during backwash) means the Ultrascreen disk filter requires fewer units to treat design flows, lowering construction costs. The compact design and fewer required units also make it ideal for adding to existing plants facing more stringent discharge requirements. Matt Shoemaker, North American Sales Manager for Leopold -- A Xylem Brand, talks through the features of the Type 360 Underdrain, a bolt-down system with a design that allows for longer filter runs, higher efficiency, less backwash water, and extended media life. With a flow concept that avoids dead zones and patented self-cleaning capabilities, the Type 360 is easy to own and operate. Get a close look and hear more about its unique properties in this video. The Leopold brand of Xylem has been providing the most efficient water and wastewater treatment filtration systems available since 1922. The Leopold difference – effectively backwashing 100 percent of the media. Combined with the installation of the new filter media and wash troughs, this particular type of underdrain and media retainer brought the water treatment plant’s operations up to speed. A plant manager in Colorado became frustrated by the consistently short filtration run-times and the large amount of water wasted by the four dual-cell bottom filters used to clean the region’s drinking water. Xylem’s Leopold Type XA underdrain with I.M.S 200 media retainer, new filter media (12” silica sand/18” anthracite), and wash troughs, emerged as the top choice. Xylem, a leading global water technology company dedicated to solving the world’s most challenging water issues, has won a contract worth almost $1.5M USD to provide wastewater treatment technology as part of a sewage plant upgrade project in Bengbu City (known locally as Pearl City), Anhui Province, China. Xylem, a leading global water technology company dedicated to solving the world’s most complex water issues, has secured a contract to supply filtration technology to the new Beaver County water treatment plant in Baden, Pennsylvania. Water professionals are seeking innovative approaches to address water supply challenges associated with population growth, drought, and environmental protection. Xylem, a leading global water technology company dedicated to solving the world’s most challenging water issues, has secured a contract worthUSD $1.9M from the City of Caldwell in Idaho to add an advanced wastewater filtration system to the city’s existing wastewater treatment facility. Nearly 50% of electricity-related emissions from the global wastewater sector could be abated at negative cost by investing in readily available technologies. Xylem, a leading global water technology company dedicated to solving the world’s most challenging water issues, has been awarded a contract to provide advanced filtration technology to the Metropolitan Water District of Southern California’s F.E. Weymouth Water Treatment Plant in La Verne, California as part of a project to retrofit the plant with biologically active filtration and ozone. Xylem, a leading global water technology company dedicated to solving the world’s most challenging water issues, has been awarded a $1.3M contract to provide advanced treatment technology to the Saigon Water Corporation’s Tan Hiep Water Treatment Plant 2 in Vietnam’s capital, Ho Chi Minh City. Xylem Inc., a leading global water technology company dedicated to solving the world’s most challenging water issues, has been awarded a contract to provide an existing wastewater treatment plant with advanced treatment technology, which will play a key role in an initiative focused on improving water quality in the Chesapeake Bay. The North Columbus Resource Facility recently completed a $12-million replacement of its settled water filtration, removing the existing Wheeler filters, their three-part media and 10-inch poured concrete underdrains, which were no longer efficient. Xylem Inc., leading global water technology company, has unveiled a new drinking water treatment solution that removes the most challenging contaminants, including ‘contaminants of emerging concern’ (CECs), at ACE 15, the American Water Works Association annual conference and exposition, taking place at Anaheim, California, June 7-10. When a broken shaft caused a malfunction in one of the brush aerators at the village of Liberty, NY, WWTP, the village worked with its engineers to develop a plan for repair and upgrade. 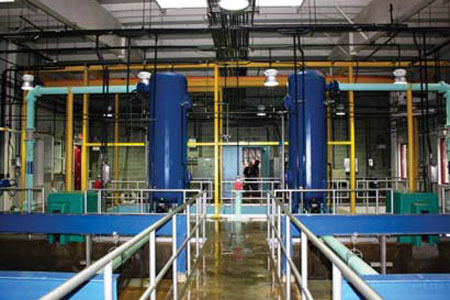 With the town of Johnstown, CO's, water treatment plant began operating its circular clarifier systems at maximum capacity to meet summer peak demand rates, consultants recommeded increasing plant capacity and using dissolved air flotation technology for their clarification process. The city of Florence, Colorado Water Treatment Plant (WTP), located 75 miles south of Denver, uses blended surface water taken from the city’s southernmost water reservoir. Together, two water treatment plants in Boulder, CO, have the capacity to treat 55 million gallons per day (MGD). When severe drought conditions restricted the source water supply of the Betasso WTP, the city decided to expand the capacity of the Boulder Reservoir Water Treatment Plant (WTP). Faced with a tight capital budget, a city in British Columbia required a new design for a water treatment plant capable of a maximum daily water production of 21 MPG during peak demand periods, with an ultimate demand of 29 MGD. Xylem, a leading global water technology company dedicated to solving the world’s most challenging water issues, has been contracted to provide clarification and filtration systems for the expansion of the Tai Po WaterTreatment Works in Hong Kong. To ensure treated water complied with the most stringent drinking water standards, including the Environmental Protection Agency (EPA) Stage 2 Disinfectants and Disinfection Byproducts Rule (State 2 DBPR), the City of Cambridge, MA, WTP decided to implement a robust multibarrier treatment solution. Xylem Inc., a leading global water technology company dedicated to solving the world’s most challenging water issues, has announced an exclusive agreement with Nuove Energie S.R.L. to distribute a cutting-edge tertiary disk filter system for wastewater reuse and discharge requirements in the United States and Canada. Xylem, a leading global water technology company focused on addressing the world’s most challenging water issues, was awarded the 2014 WateReuse Equipment Manufacturer of the Year by the WateReuse Association at their 29th Annual Symposium in Dallas, Texas. Xylem’s Leopold Oxelia is designed for municipal wastewater treatment. The ozone-enhanced biologically active filtration system and multi-barrier solution combines ozone, filtration and analytical instrumentation to deliver optimal wastewater treatment for water reuse and discharge into sensitive waters. Xylem Inc., a leading global water technology company dedicated to solving the world’s most challenging water issues, has supplied wastewater treatment denitrification systems to three wastewater treatment plants in eastern China as part of a national strategy to improve wastewater treatment by 90 percent over five years. Xylem Inc., a leading global water technology company dedicated to solving the world’s most challenging water issues, has launched a cutting-edge, ozone-enhanced biologically active filtration system and multi-barrier solution for municipal wastewater treatment. Xylem’s Leopold Oxelia combines ozone, filtration and analytical instrumentation to deliver optimal wastewater treatment for water reuse and discharge into sensitive waters. Howard County, Maryland, Bureau of Utilities recently completed the $92-million Addition No. 7 project at the Little Patuxent Water Reclamation Plant (LPWRP) to improve the quality of the plant’s effluent discharge and to reduce harmful nutrients reaching Chesapeake Bay. The project’s various increments took over five years to complete and incorporated innovative design solutions and state-of-the-art technologies for denitrification, aeration and disinfection. 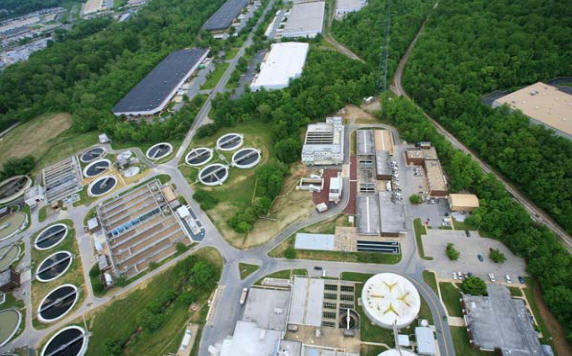 The project presents a model for Maryland’s 66 largest wastewater treatment plants and possibly procurement of municipal facilities elsewhere facing increasingly stringent regulatory changes. Xylem, Inc. will present its products and technologies for every stage of the water/wastewater treatment process at the 2014 AWWA Annual Conference & Exposition (ACE14). Spikes in peak demand at the 3.0 MGD Freedom District Water Treatment Plant in Carroll County, MD, exceeded 70 percent of the plant’s capacity, and the existing clarifier made for a lengthy sludge-removal process. After staff installed a dissolved air flotation (DAF) pretreatment system to improve the efficiency of the membrane filters, the now 4.0 MGD facility has reduced maintenance for operators. The system also safeguards against pathogens that can pass through traditional sand/diatomaceous (S/D) filters. Ron Port, Vice President of Xylem Inc.’s Treatment Business Unit and Xylem China, discusses the benefits of Xylem’s new XA Underdrain product. Xylem Inc., a leading global water technology company focused on addressing the world’s most challenging water issues, has launched a new underdrain as part of its complete Leopold® Filterworx® gravity media filtration system. During the hot and dusty summers just a few years ago, many thirsty residents of Waco, TX, were reluctant to slake their thirst with the city’s water. A $92-million expansion completed earlier this year (2012) at the Little Patuxent Water Reclamation Plant (LPWRP) in Savage, MD, presents a model integration of bellwether aeration, disinfection and enhanced nutrient removal (ENR) systems added in tandem with other infrastructure upgrades, that have significantly improved the plant’s effluent and reduced harmful nutrients from reaching Chesapeake Bay. Xylem Inc., a leading global water technology company focused on addressing the world’s most challenging water issues, has engineered a new water filtration technology to replace support gravel in the wastewater and porous plates in drinking water markets. Leopold - A Xylem Brand has long been a worldwide leader a in the water and wastewater treatment industry supplying both filtration and clarification systems. Since its establishment in 1924, Leopold has pioneered and acquired a number of innovative technologies aimed at improving the quality of water while reducing costs. Although more than 8,000 American cities and towns have treatment plants featuring Leopold products, our influence has not been limited to North America. Clients around the world have also come to rely on Leopold's expertise and technological leadership in water and wastewater treatment. Our systems are in use on six of the seven continents, in every South American country, and in most European and African countries.